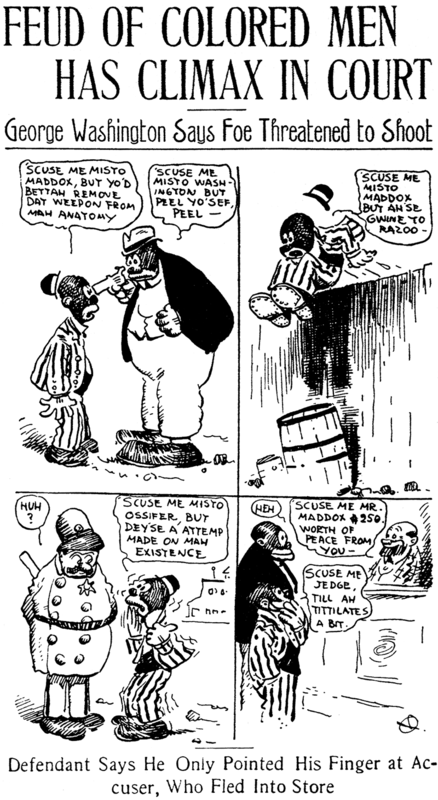 January 22 1909 -- About as racist as imaginable, this sort of flippant and contemptuous treatment of black-on-black crime was pretty standard newspaper fodder in the day. It's amazing that Herriman could bring himself to create this, given that he was (secretly) blavk himself. Or black-ish, I guess, as a Creole. Looks like he absorbed all the racist attitudes of the white community. I don't really understand how that would work. I guess Herriman was just going along with the ethnic humor of that period. I'm can't exactly wrap my head around it either. Perhaps he viewed ethic humor similar to the way whites enjoy "you know you are a redneck when" or how blacks can use the racist n-word in humor. Perhaps he was more interested in making a living entertaining an audience than share the same views about race that people in the 21st Century have. What? Herriman didn't want to entertain people in the 21st Century? I guess we don't pay him enough:) Seriously when you think what the world was like when this gag was done. 1909 - WWI has not begun, American was a rural nation and even in the cities the blacks and whites lived separate. All the two races had were their prejudices. I have not seen a picture of Herriman but not all Creole looked black. Here in Louisiana Cajun country there is the French looking as well. What makes the entertainment of the past that is offensive to us today worth examining is trying to place yourself in a world where this exists. Your original question is a good one. In over a hundred years I suspect that future society will ask the same questions about us. It has been too long since this site has shown some forgotten black cartoonists work. It is always interesting in comparing the characters designs from both sides of the tracks.